Strategize, design, develop, and launch a new online spiritual community and membership site in time for Rebecca's TV show "The Last Goodbye" (Lifetime). Rebecca Rosen and her awesome COO, Jacqueline Sene, approached Peaceful Media five weeks before their “Oprah-esque” opportunity — a TV show on Lifetime that focused exclusively on Rebecca’s profound gift of spiritual mediumship. 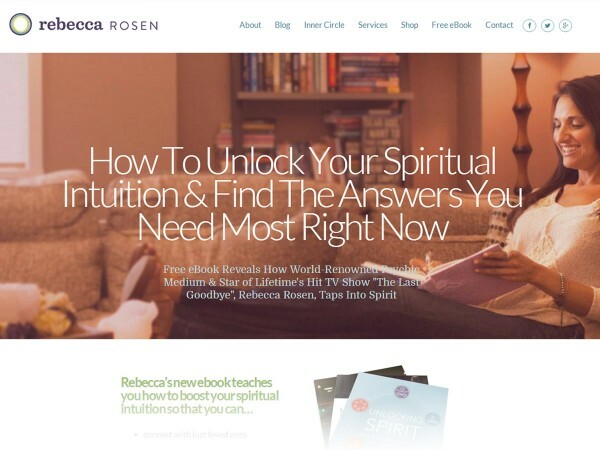 They knew they wanted to start a membership site that allowed Rebecca’s 20k+ subscribers greater access to her meditations, channeling sessions, spiritual tools, and insights. What they didn’t know was how to build it, market it, and sell it. Enter Peaceful Media! Our good friends at Ontraport (which is a business automation system and CRM that offers a fully integrated WordPress membership site plugin called PilotPress) referred Jacqueline to Peaceful Media. Within one call we had mapped out the entire process for building and deploying a custom members-only experience called Rebecca Rosen’s Inner Circle. Beyond the marketing/sales sequencing and strategy, the Peaceful team also built a beautiful environment, complete with custom iconography for each of the content categories, member forums, Soundcloud integration for embedded mp3 playback on any device, and easy, visual navigation to the content types that a member might enjoy most. Oprah hasn’t called on Rebecca for Super Soul Sunday just yet, but we have a good feeling that she’s positively ready. From start to finish (one week ahead of schedule thanks to stellar project management from Peaceful’s Cara Miller), the project felt extremely easy (due in no small part to Jacqueline’s rad teamwork) and, ultimately, very successful. Jacqueline’s testimonial below shares similar sentiments. We initially chose Peaceful Media to assist us with a membership website development. We were looking for a company that not only could do the functional part (which included our integration with our system, Ontraport), but that was willing to work with us on a tight time frame and little knowledge of how this works. Within five minutes of my initial call with Jason, I knew this was the company we wanted to work with. Both professional and accommodating, he didn’t laugh when I said five weeks. Through the entire process, the team kept me on task and made sure we met the deadline. They held weekly meeting with me, explained what I didn’t understand and were such a pleasure through the entire process! We made back what we spent to build the membership website within the first two months of operation.Their approach led us to continue to work with Peaceful Media on copywriting, further website development as well as social media consulting. For a small business with only the equivalent of two full-time employees, Peaceful Media has been a lifesaver! I feel like they genuinely want us to succeed and I consider them a part of our team.